1 Review 1/20/2012 EMPLOYEE PERFORMANCE APPRAISAL Employee Seniority Supervisor(s) Position Title Department Job Skills & Knowledge: Demonstrates professional skills and knowledge of the responsibilities and duties required to effectively function in the position including language, grammar, spelling, mathematics, reasoning and job-specific technical and/or procedural competencies. In certain positions this includes knowledge of University policies, rules, procedures and their supporting statutes. Employee understands the expectations of the position and remains current regarding new developments, technologies, methods, approaches and processes in the area of responsibility. Does not demonstrate the necessary skills and knowledge. Demonstrates limited understanding of necessary skills and knowledge. Demonstrates acceptable understanding of necessary skills and knowledge. Demonstrates complete understanding of necessary skills and knowledge. Demonstrates exceptional understanding of skills and knowledge. Quality of Work: Refers to accuracy, neatness, thoroughness and compliance with specifications according to departmental expectations and the requirements of the position. Employee listens to and understands the needs of the service recipient, whether inside or outside the University and responds to those needs; uses collaborative solutions in problem-solving as appropriate; delivers work product and services in a way that reflects credit upon the unit and the University. Employee exercises care to produce the standard the first time; readily detects, corrects or reports errors and applies feedback to improve performance. Work product is unacceptable. Work product requires constant revision and correction. Produces acceptable work product; requires some revision. Work is of very good quality; few revisions required. Work is of exceptionally high quality; virtually error free. 2 Quantity of Work/Planning & Management of Workload: Completes an acceptable volume of work and establishes appropriate priorities for fulfilling various job tasks. Demonstrates ability to set goals; plan job tasks in an efficient manner; utilize materials and equipment effectively; remain focused on work priorities; exhibit flexibility to meet changes in priorities and accommodate work interruptions. Consider timeliness in execution of assigned and agreed-upon tasks without sacrificing accuracy, quality or service recipient satisfaction. Work output is unsatisfactory; seldom meets deadlines and exhibits poor planning skills. Does not utilize resources effectively and fails to meet changes in priorities. Barely meets minimum workload requirements; occasionally meets deadlines; planning skills are limited. Resources can be utilized more effectively and changes in priorities can be better accommodated. Meets workload requirements; usually meets deadlines. Demonstrates acceptable planning skills. Resources are typically utilized effectively and changes in priorities are usually accommodated. Exceeds requirements for output; frequently meets deadlines. Demonstrates effective planning skills that allow for effective use of resources and changes in priorities. Greatly exceeds workload requirements; always on time or ahead of schedule. Demonstrates exceptional planning skills that consistently allow for changes in priorities and effective use of resources. Judgment: Anticipates and identifies problems; proposes and evaluates alternative solutions; is open to new or different solutions. Employee demonstrates maturity in taking or recommending appropriate actions and in determining which problems to handle independently and which to refer to supervisor personnel; follows up on requests for information and assistance. Consider employee s ability to make sound decisions and set priorities. Poor judgment. Is uncertain of own judgment; routinely defers to others. Generally uses good judgment. Demonstrates the ability to apply careful reasoning to recommendations/decision making. Reasoning is logical, clear and concise; comes to sound recommendations or conclusions quickly in support of office operations. 3 Initiative and Adaptability: The amount of direction needed to accomplish job responsibilities and tasks. The degree beyond the basic requirements the employee seeks to achieve and level to which employee anticipates the needs of the department and personnel. 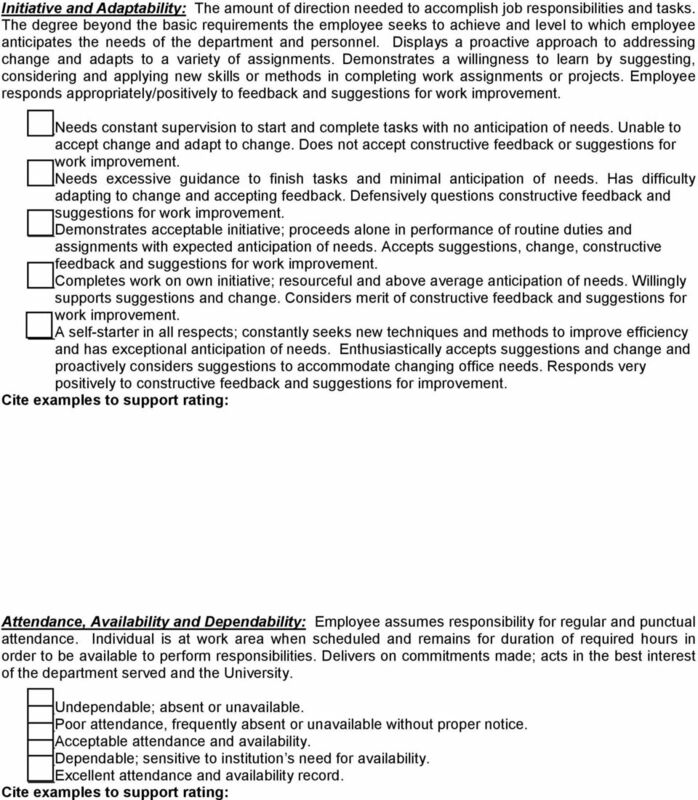 Displays a proactive approach to addressing change and adapts to a variety of assignments. Demonstrates a willingness to learn by suggesting, considering and applying new skills or methods in completing work assignments or projects. Employee responds appropriately/positively to feedback and suggestions for work improvement. Needs constant supervision to start and complete tasks with no anticipation of needs. Unable to accept change and adapt to change. Does not accept constructive feedback or suggestions for work improvement. 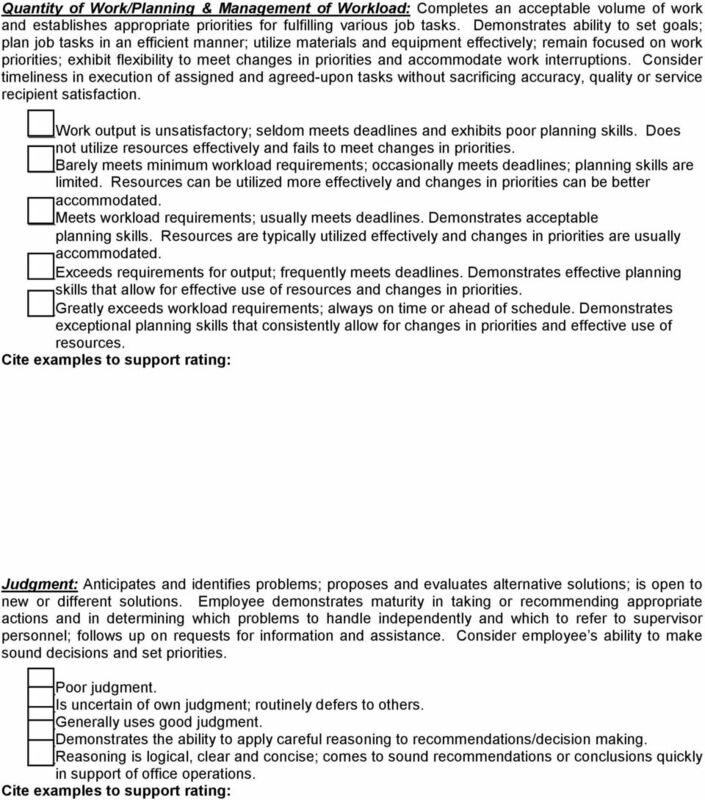 Needs excessive guidance to finish tasks and minimal anticipation of needs. Has difficulty adapting to change and accepting feedback. Defensively questions constructive feedback and suggestions for work improvement. Demonstrates acceptable initiative; proceeds alone in performance of routine duties and assignments with expected anticipation of needs. Accepts suggestions, change, constructive feedback and suggestions for work improvement. Completes work on own initiative; resourceful and above average anticipation of needs. Willingly supports suggestions and change. Considers merit of constructive feedback and suggestions for work improvement. A self-starter in all respects; constantly seeks new techniques and methods to improve efficiency and has exceptional anticipation of needs. Enthusiastically accepts suggestions and change and proactively considers suggestions to accommodate changing office needs. Responds very positively to constructive feedback and suggestions for improvement. Attendance, Availability and Dependability: Employee assumes responsibility for regular and punctual attendance. Individual is at work area when scheduled and remains for duration of required hours in order to be available to perform responsibilities. Delivers on commitments made; acts in the best interest of the department served and the University. Undependable; absent or unavailable. Poor attendance, frequently absent or unavailable without proper notice. Acceptable attendance and availability. Dependable; sensitive to institution s need for availability. Excellent attendance and availability record. 4 Interpersonal & Communication Skills: Organizes and expresses ideas and information clearly, using appropriate and efficient methods of conveying the information. Contributes to a suitable communication environment by valuing the ideas and contributions of others. Demonstrates respect for all individuals regardless of their background or culture. Consider if employee establishes and maintains effective working relationships with people at all levels (supervisor, co-workers, students, external constituents, etc.) and exhibits a courteous and accommodating image. Is uncooperative with others and unable to work with others. Is tactless and discourteous. Aggressive approach frequently results in confrontations. Tends to be uncooperative. Needs to improve tact; aggressive approach occasionally results in miscommunication; reluctantly helpful. Cooperates with others; willing to compromise. Is generally tactful and courteous; usually able to communicate satisfactorily; willing to be helpful. Readily cooperates; promotes teamwork. Consistently courteous and tactful; able to communicate effectively; strives to be helpful. Very willing to cooperate with others; inspires positive work relations. Exceptionally tactful and courteous; has excellent communication skills; goes out of way to be helpful. Integrity: Exhibits strong work ethic, honesty and integrity in all aspects of the position. Employee is sensitive to confidentiality. 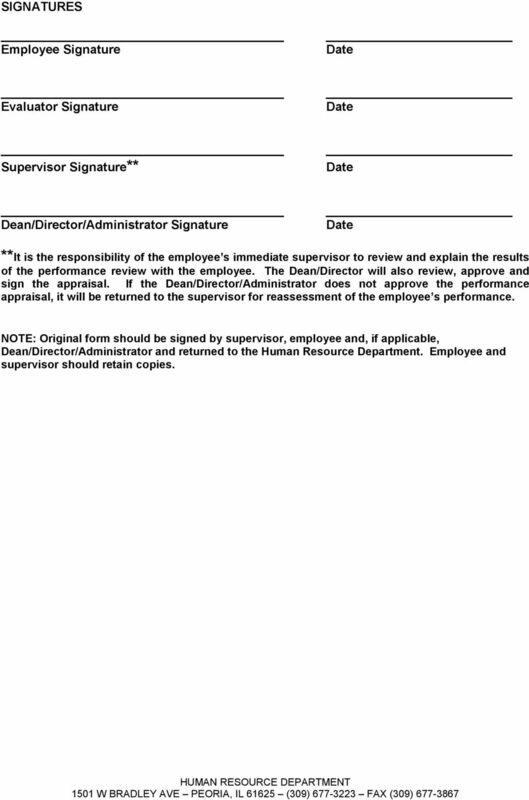 Employee complies with all department and University policies, procedures and standards of conduct. Employee adheres to required federal and state employment regulations. Level of character and professional attitude maintained. Unethical, insensitive to confidentiality and does not comply with policies, procedures, standards of conduct and/or federal and state regulations. Occasionally engages in questionable behavior and at times is insensitive to confidentiality. Employee complies with policies, procedures, standards of conduct and/or federal and state regulations most of the time. Is ethical and sensitive to confidentiality. Complies with policies, procedures, standards of conduct and/or federal and state regulations. Takes extra measures to maintain ethical behavior and ensure confidentiality. Always complies with policies, procedures, standards of conduct and/or federal and state regulations. 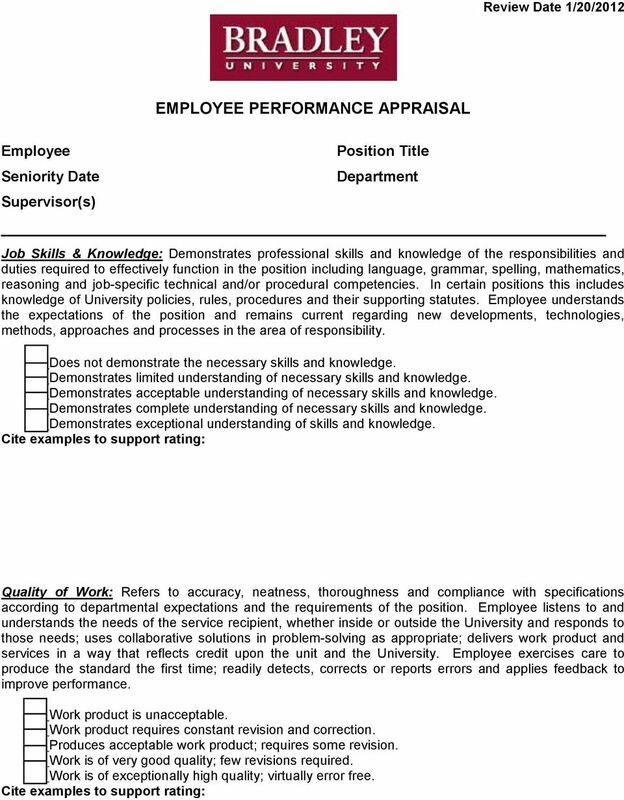 Exceptional work ethic, integrity and sensitivity to confidentiality. Strives to determine if there would be any potential way to breach confidentiality of information. Takes extra care not to violate policies, procedures, standards of conduct and/or federal and state regulations. Serves as role model.